Current and interested exhibitors, apply below or read on. The application deadline was 02/01/19, but we are still accepting applications in certain media categories. *Go HERE to register for the Oktoberfest Pumpkin Contest. This exhibit is limited to producers of foods, beverages and healthcare products for “take home” use. Tasting, sampling, and demonstrations are, of course, encouraged, but the sale of finished food items for immediate consumption is prohibited. EXAMPLE: A producer of salsa and chips may sell jars or cans of salsa for take home use, but may not sell plates of salsa and chips for “on the grounds” eating. Please include any promotional materials (sell sheets, flyers, brochures, news releases, etc.) by uploading them as images on the application form. These materials will be used to help us publicize your participation. Also include a written description of the products you intend to sell on the notes section of the application. A certificate of insurance, current for show dates, must also be sent with your application. Please scan this and upload it as an image on your application. Feel free to contact our office for any information you may need. We greatly look forward to your participation. For information on advertising, spaces and displays, security, complimentary on-site camping, etc., please download the 2019 schedule/brochure (DOWNLOADABLE BROCHURE), or read on. *Please note that the booth space fee for the Handcrafted Food & Healthcare Products is noted above, and differs from that of the art & crafts exhibitors. The shows are open to applicants in all art and crafts media. All work must be original in both design and execution. The following categories are not acceptable and applications in these areas will be returned without jurying: objects made from commercially sold kits or plans, dried or plastic flower arrangements, imports of any kind, objects produced from commercially manufactured molds and embellished objects. All work displayed must be for sale with the artist or craftsperson in attendance. The fairs are designed for exhibitors selling their own work and the presence of agents or vendors in lieu of the artist is not acceptable. All spaces are arranged to give exhibitors equal access to the visiting public. Applicants may request a maximum of two spaces. If accepted, each exhibitor must have his or her own full size booth and there will be no sharing of spaces. All display materials must be provided by exhibitors. Tables should be covered on all sides, and storage boxes must be out of sight. A full backdrop is recommended. Outside exhibitors must provide all desired tenting. A space and a half is available for all shows. Check the appropriate box on the application form. Applicants must submit four current color images of your work and one color image of your booth or display. The booth image should be a full frame, head on shot without anyone present in the booth. If a booth shot is not available, the fifth image should be an additional color image of your work. Applicants may enter in as many categories as he or she wishes. A separate set of five images must be submitted for each category and only work in the accepted medium may be eligible for display. *If you intend to exhibit jewelry in your display, you must submit images of this work. If accepted, Quail Hollow Events may use your imagery on our website, social media, and online or print advertising. Please contact us if this is an issue. Electricity is available in the tents and buildings only and is limited to 300 watts per booth space. If you need electricity for your booth, make sure you check the appropriate box on your application. There will be a $25.00 service charge in addition to the regular electricity charge to get an electric hookup during set-up or fair hours. The organizers will provide security for all hours of all shows between set-up and breakdown. Exhibitors may remain set up at night, though the organizers assume no responsibility for theft, damage or loss of an exhibitor’s wares or display materials. In 2019, we will continue a flexible booth sitter program. Exhibitors are encouraged to pre-arrange scheduled booth sitters (for a daily lunch break, for example) or can call for immediate booth sitting via cell phone during show hours. A booth sitter phone number will be provided upon registration. We will employ several competent booth sitters to implement this service. Accepted exhibitors will be sent a list of hotels, motels, inns, restaurants and camping facilities in the area. Artists and craftspeople will be allowed to camp on the grounds in camper vehicles for all shows. Utilities are available for a nominal fee. Tent camping is welcome at the Ulster County Fairgrounds, though prohibited at the Dutchess County Fairgrounds. Visit Ulster County Tourism and Dutchess County Tourism for an extensive list. • Publicity for each of our shows will include radio, TV, internet, social media, billboards and print media concentrated primarily within four weeks of the events. • We have been successful in attracting the “New York Market” with an extensive campaign ranging from high-traffic billboards to targeted social media and digital marketing to radio and print advertising. *It is essential that your website and email address be included on your application. We have many links with tourism and exhibitor sites and hope to include you as part of our online campaign. The Furniture and Architectural Crafts feature will be continued in 2019 for both New Paltz shows. Exhibitors accepted in this category will be given oversized booth spaces to “spread out” and display larger pieces with wider aisles. Furniture artists will include all categories of furniture making [not limited to wood]. Architectural crafts will include custom door makers, window and stained glass artists, creators of custom kitchens and “built-ins,” custom masonry workers, makers of hand-crafted fixtures for the home [tiles, ceramic sinks, etc.] and all other aspects of both residential and commercial architectural crafts. General contractors, specializing in custom design and construction are also invited to apply. Applicants must meet the same eligibility standards as other juried exhibitors and should check the appropriate box on the application form. You may also submit brochures in lieu of digital images in this show category. The Crafts Supplies area, implemented in 1985, will also be continued in 2019. Applicants may submit brochures or other information in lieu of art/crafts images for this category. Only art and crafts materials, tools and supplies may be sold. Finished manufactured products that compete in any way with the work of juried exhibitors are not permitted. The eligibility of any products will be at the sole discretion of Quail Hollow Events and offending items will be asked to be removed. We encourage all applicants to fully list the items to be sold with your application. A separate tent or outdoor space at the Fairgrounds will be dedicated to craftspeople in LANDSCAPE ARTS. Media will include outdoor sculptures, garden furniture, trellises, custom masonry builders, landscape architects, bent-wood vine constructions and other work related to handcrafted landscape arts. Note: The Landscape Arts Area is featured in the Spring show only. If you wish to participate in the Fall show, request tent space, outdoor space or the Furniture/Architectural Crafts tent. Quail Hollow Events will provide a separate area for demonstrating exhibitors. Artists wishing to demonstrate should select the appropriate box on their application. If accepted, you must contact our office to make any necessary special arrangements. Demonstration spaces are oversized to accommodate both your display and demonstration. 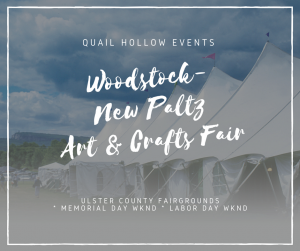 New Paltz Shows: A separate area of the Ulster County Fairgrounds is available for exhibitor camping. There is no charge unless you request electricity. Charges are $30.00 per night for a 20 amp circuit and $40.00 per night for a 30 amp circuit. 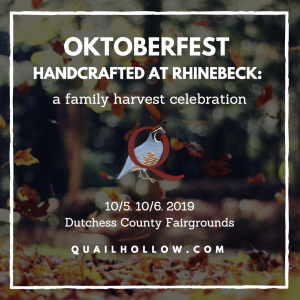 Rhinebeck Show: A separate area of the Dutchess County Fairgrounds is available for exhibitor camping. Vendors in camper vehicles are welcome to camp for $40 per night (water and electric included). There is now free WiFi on the Ulster County Fairgrounds. The deadline for all shows is February 1, 2019. For Art & Crafts Exhibitors, all notifications of acceptance, waiting list and rejection will be emailed by February 15, 2019. There will be a $25.00 penalty charge for all checks returned to Quail Hollow Events, regardless of the cause of its return. Notice received 0 – 29 days prior to show……………………….no refund unless special accommodations have been agreed upon by management and exhibitor. Accepted exhibitors will be given fair announcement postcards to notify customers, stores, friends etc. of your participation. FOR 2019 SHOWS – There will be a “cash- back” refund to those exhibitors with the most number of postcards collected at the gate. QUAIL HOLLOW EVENTS will give $1.00 for every postcard coming through the gate to the first 10 exhibitors with the most cards returned. 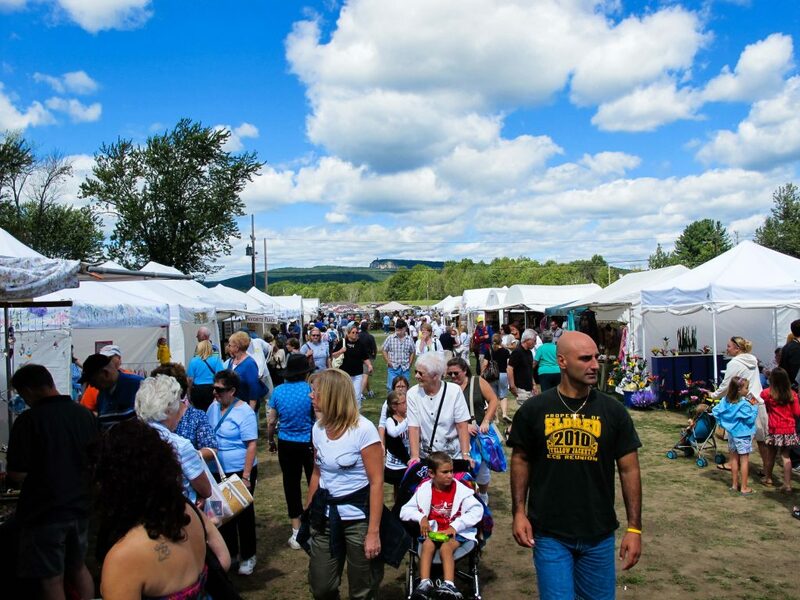 If you’re looking for more shows on the East Coast, check out Art Fair Calendar!